This article is about a collectible toy dispenser from Donkey Kong Country: Tropical Freeze. For information about a type of device in Mario Party 5, see Capsule machine. 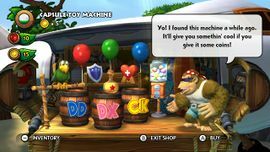 The Capsule Toy Machine is a vending device in Donkey Kong Country: Tropical Freeze that yields figurines enclosed in capsules. It is owned by Funky Kong, who claims to have found it "a while ago", and is put on display in his shop, Funky's Fly 'n' Buy. The figurines themselves are miniature representations of the main characters and the Snowmads. Only a few figurines can be obtained at the beginning of the game, but six more figurines are added to the machine for each boss defeated. Each figurine costs five Banana Coins. Figurines are dispensed at random, and the player can get duplicates. Once the player obtains all figurines available before beating the next boss, Funky will say that he is out of stock and will not let the player buy any more figurines until new ones are added. Similarly, when the Kongs own all distinct figurines, Funky Kong refuses to sell any more to them, instead asking if they are interested in trading later. Snowmads 3 – contains figurines of heavy-type Snowmads, like Waldough and Big Sphen. The following table lists all figurines and the condition to make them available in the shop. This page was last edited on February 21, 2019, at 16:17.